Unbelievably, our man of many loveable talents had his car broken into a few weeks ago AND the miserable thieves stole his music and DJ gear… HUGE SAD FACE!! 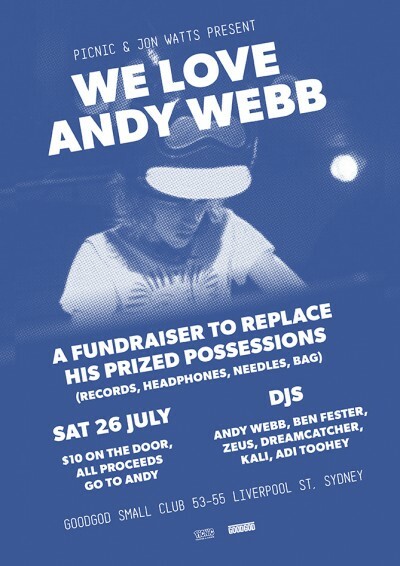 So here we are with a fundraiser, put on by Picnic, Jon Watts and friends, to get Andy some cash to replace his stolen records, fully loaded Shure cartridges (three of them and spare needles – yes, he is t h a t profesh! ), headphones and other expensive DJ related stuff! So please come vibe out and drop us a donation! Let’s make Andy feel like he’s king of the world!